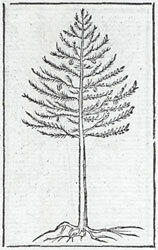 Alciato at Glasgow: Emblem: Abies. Est & in adversis maxima commoditas. The fir tree that is fit to sail the sea grows high up on the hills. Even in hard circumstances, there is great advantage to be found. 1. This is because it grows strong by withstanding the gales and harsh weather. Contrast Anthologia Graeca, 9.30ff, 105, and the much-translated 376 for an opposing view of the fir tree: “how can the fir, storm-tossed while growing on land, resist the gales at sea?” 9.31 was translated by Alciato (Selecta epigrammata, p. 98).